Below (in translation) are the only teachings of Sri Ramana Maharshi ever written directly by his own hand. Ramana Maharshi (1879 – 1950) was a realized Hindu sage and 'jivanmukta'. 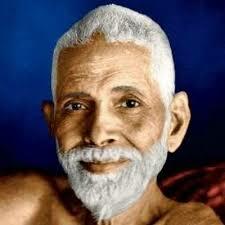 He was born as Venkataraman, but is now known as Bhagavan Sri Ramana Maharshi. He was born in what is now Tiruchuli, Tamil Nadu, India. In 1895, an attraction to the sacred hill Arunachala and the 63 Nayanars was aroused in him, and in 1896, at the age of 16, he had a "death-experience" where he became aware of a "current" or "force" (avesam) which he recognised as his true "I" or "self", and which he later identified with "the personal God, or Iswara," that is, Shiva. This resulted in a state that he later described as "the state of mind of Iswara or the jnani". Six weeks later he left his uncle's home in Madurai, and journeyed to the holy mountain Arunachala, in Tiruvannamalai, where he took on the role of a sannyasin (though not formally initiated), and remained for the rest of his life. He soon attracted devotees who regarded him as an avatar and came to him for darshan ("the sight of God"), and in later years an ashram grew up around him, where visitors received upadesa ("spiritual instruction") by sitting silently in his company asking questions. Since the 1930s his teachings have been popularized in the West, resulting in his worldwide recognition as an enlightened being. Ramana Maharshi approved a number of paths and practices, but recommended self-enquiry (Who Am I) as the primary and final means to remove ignorance and abide in Self-awareness ('enlightenment').